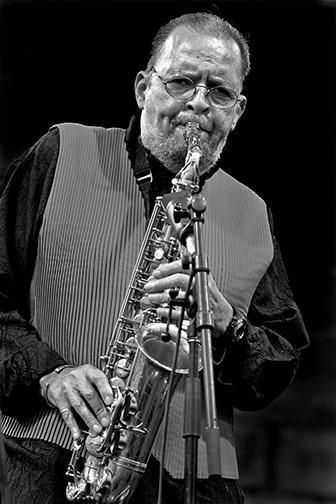 Alto saxophonist Jackie McLean, who began his stellar career while in his teens and became one of America’s foremost jazz educators, died on Friday, March 31, 2006. He was 73 years old. John Lenwood “Jackie” McLean, Jr. was born in Harlem on May 17, 1932. His father, John McLean, Sr., was a guitarist who played with Tiny Bradshaw’s orchestra. Jackie’s first instrument was the soprano saxophone, but few people besides Sidney Bechet played the straight horn at the time so there was little call for his already impressive talents. After hearing his godfather perform in church, McLean switched to alto sax and made it his permanent focus. His boyhood friend Sonny Rollins shared McLean’s interest in a musical career; in the early 1950s both teens studied with their neighbor, bebop pianist Bud Powell. Thelonious Monk was another neighbor, family friend and influence. And, of course, Charlie Parker was a predictable influence on the keen-eared boy. McLean’s first recorded appearance was on Miles Davis’ Dig (1951, Prestige), made when the altoist was nineteen. He debuted as a leader at 23 with The Jackie McLean Quintet (1955, Ad Lib, reissued by Jubilee/Fresh Sound), featuring pianist Mal Waldron and trumpeter Donald Byrd. At the end of 1955, McLean was working with pianist George Wallington at Café Bohemia. Bassist and bandleader Charles Mingus came by the club, heard the gifted young man, and was impressed enough to hire him almost on the spot. The altoist was featured on Mingus’ Pithecanthropus Erectus (Atlantic, with a special highlight on “Portrait of Jackie”), The Clown (1957, Atlantic) and Blues and Roots (1959). He credited Mingus with encouraging him to quit imitating Charlie Parker’s alto saxophone style and find his own voice, which became one of the most distinctive in hard bop. Not long after cutting Pithecanthropus Erectus McLean joined Art Blakey’s Jazz Messengers, which became New York’s premier hard-bop ensemble and a continual cauldron of talent development. His recordings with Blakey included the Messengers’ self-titled debut, Drum Suite, Hard Bop and Jazz Messenger (all 1956, Blue Note). In ‘56 and ’57 McLean headlined a series of albums for Prestige and New Jazz (among them Lights Out, Strange Blues and Alto Madness), many built around jam sessions and not very successful. Like many of his contemporaries, McLean overcame a nearly crippling addiction to drugs in the 1950s, and later lectured on the subject nationally. From 1959 to 1961 he acted and played in Jack Gelber’s legendary jazz stageplay, “The Connection”. In 1959 McLean landed a contract with Blue Note, issuing Jackie’s Bag to solid acclaim. He had already begun absorbing the influence of maverick altoman Ornette Coleman, and on New Soil (actually released before Jackie’s Bag) he gave his first nod to the emergent free jazz. McLean remained with Blue Note for eight years and more than twenty albums, frequently crossing the lines between hard bop and free jazz on sessions like Let Freedom Ring (1962, with Coleman drummer Billy Higgins in the band), One Step Beyond and Destination... Out! (both 1963). Coleman himself guested on trumpet on McLean’s New and Old Gospel. Trumpeter Charles Tolliver and trombonist Grachan Moncur III were among McLean’s strongest sidemen in this phase of his career. By 1967 McLean had exhausted most of his interest in free jazz, along with his Blue Note contract. The following year he began his second career as an educator, eventually teaching African-American history, music and culture at the University of Hartford. He was the founder and artistic director of the jazz program at the university’s Hartt School of Music; the program was later named the Jackie McLean Institute of Jazz. He also founded the Artists Collective in Hartford with his wife, actress Dollie McLean. In the 1970s he made a handful of albums for Steeplechase, some alongside tenorman Dexter Gordon. Mostly, however, he spent the better part of two decades concentrating on education. In 1988 he recorded his “comeback”, (Dynasty, Triloka), in the company of his son, tenor saxophonist Rene McLean. The 1990s saw him re-signed to the revived Blue Note, issuing sturdy albums like Fire and Love (1998) and Nature Boy (2000). In 2001 McLean received an American Jazz Masters Fellowship from the National Endowment for the Arts. Jackie McLean’s survivors include his wife, Dollie, and son, Rene. Jackie McLean at the 2004 JVC Jazz Festival in Newport, R.I.